To freeze eggs, crack them open into a bowl and break up yolks by stirring. 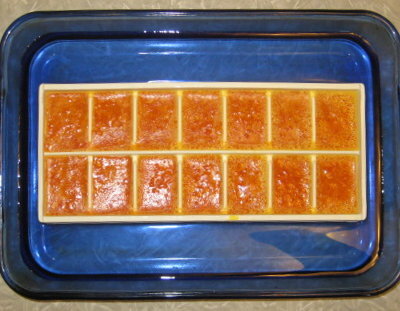 Pour into ice cube trays and freeze overnight. Transfer egg “cubes” to an airtight container [my note: a freezer bag works great!] and store for up to a year. Bonus: You can thaw the cubes individually and make as many servings of eggs as you need. This is a great little trick, whether you are taking advantage of a store savings deal, or if your hens are laying faster than your family can keep up with them. Just put some in the freezer and pull them out as needed. Whether you are new to couponing or a veteran, you’ll find tips and tricks you can use for saving even more money in my new book, Saving Savvy. This is wonderful news! How often I have been given farm fresh eggs in abundance and had to give away and bake a lot to use them up! Thank for sharing! Great idea; thanks for sharing 🙂 — is one “egg cube” roughly equivalent to one egg? Sophie, I guess it depends on what kind of ice cube tray you have, but I have found that one cube is not quite a medium-size egg. I go by 2 cubes = 1 large egg. If you try it, let me know what you think. I plan to use silicone muffin bakeware – 2 eggs per muffin spot – should pop out easily to store after freezing! This works great for freezing portions of buttermilk for future recipes. What is the best way of defrosting the eggs? Do you put them in the fridge for a while…defrost in microwave? Thanks for all you do and can’t wait to hear! Kelly, my eggs won’t pop out of the ice cube trays! Help! Should I maybe sit the trays in a little bit of warm water? They’re so stuck, my trays are cracking. this might be too late 🙂 but, if you turn the tray upside down and run hot water over the bottom, they should pop out nicely. I do this with lots of things that I freeze – I freeze sauces, baby food, homemade stock – all kinds of things in tupperware type containers and then pop out into a freezer bag – that way I can have larger portions if I like.